One of the most thoughtful gifts I’ve ever received was a bottle of exotic smoked paprika from my friend Betty. We were talking smoked paprika at a monthly musical gathering. The following month she surprised me with a bottle of my own, from her supply of La Chinata sweet smoked paprika. La Chinata, a manufacturer in Spain, also makes hot smoked paprika and bittersweet smoked paprika, half hot and half sweet. Smoked paprika tastes completely different than regular sweet paprika. It imparts a strong smoked bacon-like flavor to many foods. Before I realized this, I used it unsuccessfully on such vegetables as cabbage and zucchini. I had more success with bean dishes, hearty soups, and meats. This recipe is my favorite so far. It combines the strong smoky flavor with a mellowing fat free sour "cream." This recipe is appropriate to winter because it uses plenty of seasonal onions. It provides stick-to-the ribs staying power, even without full-fat sour cream. The flavor is dark and smoky, a bit too hearty for summer fare, but perfect for long cold nights. Fat-free sour “cream” is actually made with fat-free milk, not cream. To compensate for milk’s thinness compared with cream, some manufacturers use gums, cornstarch, and other thickeners. Find a brand like Lilly that uses only milk and live lactobacillus cultures. Your cooking results will be better, and your food less processed. As always, you may want to play with the ingredient quantities. ¾ cup of broth will make a thicker sauce. Amount of smoked paprika can vary from 4 tsp. to 2 tbsp., and you might want to reduce the amount of sour cream slightly. 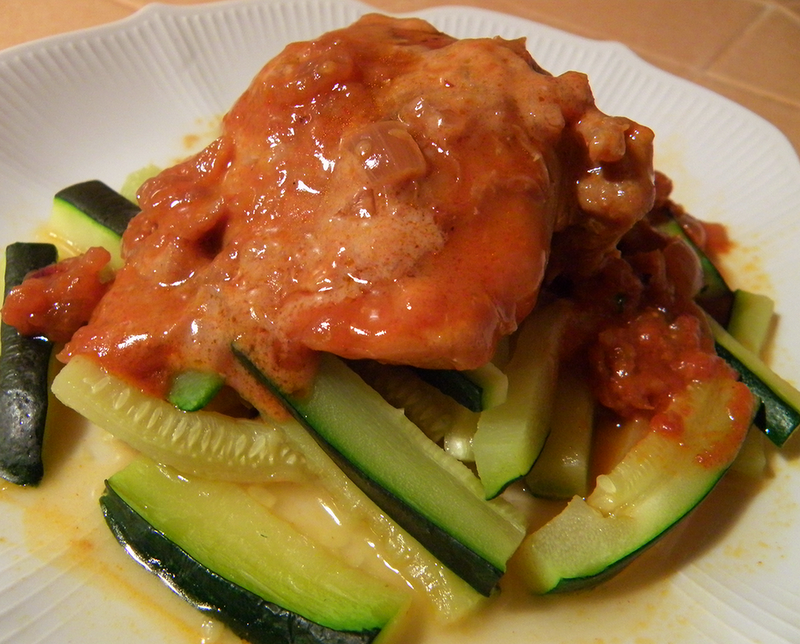 Serve this over steamed zucchini matchsticks for a colorful and healthful alternative to traditional noodles. Spaghetti squash is another nontraditional all-veggie base layer. Heat oil in a nonstick skillet or electric frying pan at 325 degrees F. Brown chicken on both sides for about 15 or 20 minutes. Remove to a plate. Scrape up browned bits in frying pan and add chopped onion, stirring to coat with oil and chicken juices. Saute, stirring, until onion is tender, about 10 – 15 minutes. Put chicken back into frying pan along with any juices that have accumulated. 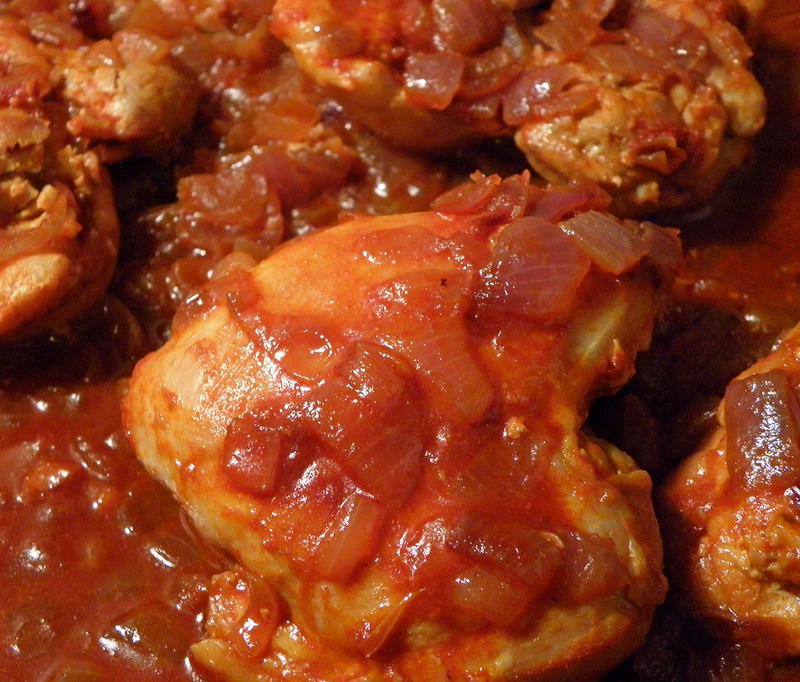 Combine salt and paprika, and sprinkle over chicken and onions. Add bouillon or broth. 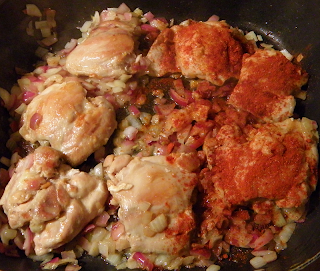 Baste by spooning broth over chicken so that all paprika is moistened. Bring to boil. Cover pan and lower heat to 300 degrees F. Cover pan and simmer for 20 – 30 minutes, basting every 5 – 7 minutes by spooning broth and onions over chicken to incorporate and cook the paprika. Stir sour cream into sauce. Heat until warmed through. Serve immediately over noodles, rice, spaghetti squash or julienned steamed zucchini. 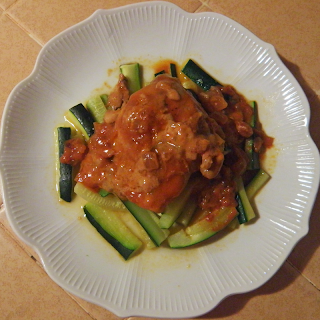 To reheat, microwave sauce separately from chicken, stirring frequently. Sauce will take longer than chicken to heat and is prone to separating. You may also heat sauce on low in small saucepan. I love the "pay it forward" aspect of this- thanks for sharing the new recipe! I enjoy smoked paprika as a seasoning in quinoa salad, as well as in mashed sweet potatoes. A little goes a long way. Mashed sweet potatoes with smoky paprika...even knowing both flavors I can't imagine what it would taste like, so will definitely give it a try. Thanks, Betty!